A domain describes the technical attributes of a field, such as the data type or the number of positions in a field. The domain can define a value range describing the valid data values for the fields that refer to it. Different technical fields of the same type can be combined in a domain. Fields referring to the same domain are changed at the same time the domain values are changed. This ensures consistency for all these fields. the separate values are stored. for all fields that refer to the domain. Flag to determine if a field refering to this domain can contain negative values, if it can this flag must he set. When the field contents are output on the screen, the first position of the output is reserved for a plus or minus sign. If the indicator is not set but the field contains negative values, problems may occur during screen output. You can only make entries in this field for data types DEC, FLTP, QUAN, and CURR, as well as for decimal floating point numbers. Flag which specifies whether the set of values of a domain is restricted through entry of fixed values. Value table is a table that contains the list of values that can be input into fields refering to this domain. by entering a value table. The system will then suggest the value table as check table when you try to define a foreign key for this field. You can override this proposal. Entering a value table does not implement a check. The check against the value table only takes place when a foreign key is defined. Conversion takes place when converting the contents of a screen field from display format to SAP-internal format and vice versa and when outputting with the ABAP statement WRITE, depending on the data type of the field. If the standard conversion is not suitable, it can be overridden by specifying a conversion routine in the underlying domain. A conversion routine is identified by its five-place name and is stored as a group of two function modules. The INPUT module performs the conversion from display format to internal format. The OUTPUT module performs the conversion from internal format to display format. If a screen field refers to a domain with a conversion routine, this conversion routine is executed automatically each time an entry is made in this screen field or when values are displayed with this screen field. Activation status of an object. •New: New object that was not yet activated. •Active: Active version of an object. All components of the runtime environment (ABAP processor, database interface, etc.) use this active version. •Partly active: The definition of a partly active object is consistent. When an object is activated, all the dependent objects are automatically adjusted to the change in the object. An error occurred when these dependent objects were adjusted. For example, a table is marked as partly active when a foreign key of the table refers to a check table that could not be activated. • Revised: Object that was changed after activation but was not yet activated again. The runtime environment uses the active version of the object in this case. The changes therefore only take effect once the object has been activated again. If the value is not equal to SPACE, the object is partially active. The value SPACE means that the object is active. A partially active object is consistent and can be used, but an error occurred when adjusting dependent objects. Partially active domains and data elements can be used immediately. When using partially active tables, you must first make sure that the ABAP Dictionary and runtime objects agree. The activation type determines whether the table can be activated directly from the ABAP Dictionary or whether the runtime object has to be generated by a C program before the activation of the table in the ABAP Dictionary can take place. •01 : The runtime object must be generated by C program before the table can be activated from the ABAP Dictionary. 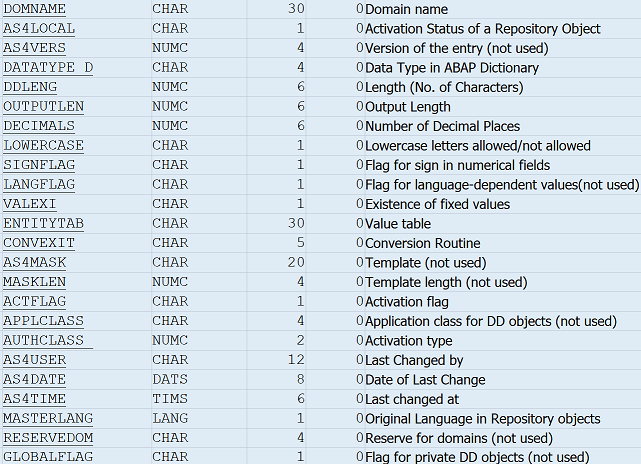 •02 : Activation of the table in the ABAP Dictionary is possible. The runtime object is generated in the process. Since the table is however used in C programs, the structure must be specially adjusted in these C programs. •10 : This is an initial table required before R3trans can run. •00 : The table is not classified since it cannot be assigned to any of the activation types specified above. This is the default value. default value. The MASTERLANG field contains the maintenance language of a Repository object. In ABAP Dictionary objects, this field is only used for data elements. If this field has any contents for other ABAP Dictionary objects, these are not relevant. The checkbox AM/PM time format supported is used for specifying the time format to be used on screens (24-hour or 12-hour format) for time fields (fields of data type TIMS). By default, time fields are issued in the 24-hour format. If the checkbox AM/PM time format supported is set, the time format specified in the user master record is used for display on screens (if sufficient space is available). In the user master record, a 12-hour format with AM (am) or PM (pm) can be specified.